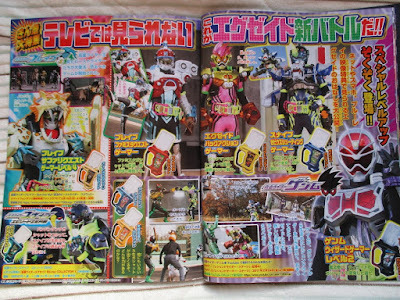 Here are some newest Kamen Rider EX-Aid Terebi Magazine scans featuring the new Level-Up forms that we will be seeing in the upcoming specials and spin-offs! 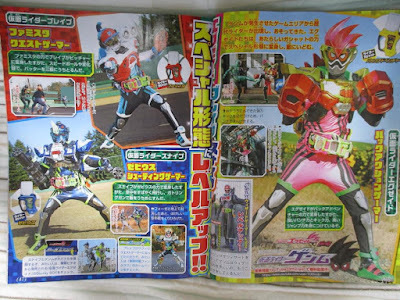 In the 2nd part of the Kamen Rider Genm special, the Gamer Riders will obtain new Gashats that are based on Namco games like Pac-man, Family Stadium and Xevious and this are Kamen Rider Ex-Aid Pac Action Gamer, Kamen Rider Brave Famista Gamer and Kamen Rider Snipe Xevious Gamer. As for both Snipe and Brave who will be starring in their own mini-series, Hiiro will obtain the Night of Safari Gashat and level-up into Kamen Rider Brave Safari Quest Gamer Level 4 while Taiga will get his hands on the Bang Bang Tank Gashat and level-up into Kamen Rider Snipe Tank Gamer Level 4. All the spin off's forms are basically recolors. But with a bunch of tweaks.